No matter what type of content you create, you want your featured snippet to appear in position zero. Find out why position zero is so critical and learn how increase the chances of your content ranking in this prime spot. Even if you aren’t familiar with the term “position zero,” you undoubtedly observe it in action almost every time you do a Google search. Essentially, position zero refers to the featured snippet that appears at the top of the search engine results page (SERP). Featured snippets receive prominent placements above search results, and they reveal much more than the URLs, page titles, and meta descriptions that other search results generate. Instead, featured snippets include excerpts that answer your question or relate directly to your search. If you think position zero sounds like the prime place for your content to appear, you’re right. 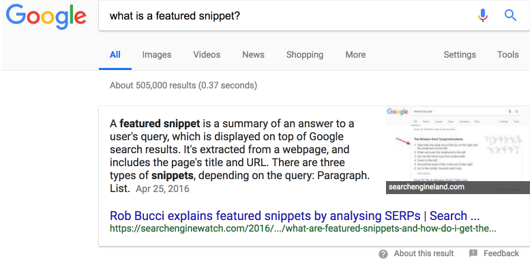 Getting your featured snippet to rank for a search can give you a long list of benefits. First, you’ll have a better chance of getting users’ attention. After all, your content will be at the top of the page in a position that’s nearly impossible to miss. Since Google highlights featured snippets so prominently, users will quickly understand how relevant and valuable your link is to their search. That means your website will appear more credible and trustworthy, which could increase your click-through rate (CTR). On average, users are twice as likely to click on featured snippets than on the first search result, which means landing in position zero can increase your website traffic substantially. If you’ve designed your content marketing strategy around growing your list, generating leads, or driving sales, position zero will also give you a better chance of achieving the conversion you’re seeking. If some of your content struggles to rank first or ahead of your biggest competitors, featured snippets offer yet another benefit. It’s easy to assume that the first search result also lands the featured snippet, but that isn’t necessarily true. For about 30 percent of searches, the top result gets position zero. Yet the second-ranking result gets position zero nearly a quarter of the time, and the third- and fourth-ranking results each land the featured snippet about 15 percent of the time. That means having featured snippets could propel your low-ranking content into position zero overnight. When your link appears in position zero and your content successfully addresses the user’s initial query, you’ll also lower the chances of users returning to the SERP and browsing the other search results. That means you’ll indirectly prevent users from clicking through to your competitors’ pages while driving more business to your site instead. While high-quality content that features relevant keywords certainly offers added value for readers, it takes more than excellent writing, related search terms, and careful research to land the featured snippet. Instead, you need great content that meets a few key criteria. First, it’s important to note that not every piece of content has an equal chance of having a featured snippet. In fact, studies have shown that Google is much more likely to feature content focusing on certain topics. If your content focuses on finance, health, nutrition, or DIY, it has a better chance of ranking in position zero, especially if it answers a question. Since featured snippets provide quick responses to search queries, your content must answer a question. If your content doesn’t rank for common questions, you may need to rethink your keyword research slightly. While not all keywords are questions, you can add terms like “how” or “why” before high-ranking search terms to turn them into queries and help your content generate featured snippets. There’s no need to stop with answering a single question. As you’re doing keyword research and assessing relevant queries, look beyond the featured snippet. Google’s “People also ask” section might offer several additional ideas for related featured snippets to target. Since position zero can highlight paragraphs, lists, or tables, your page may have the opportunity to rank for several featured snippets. If you’re concerned about search engine optimization (SEO), you’ve undoubtedly already researched the keywords that your competitors rank for. You can use some keyword research tools to find out what featured snippets your competitors have claimed, too. Make a list of the search queries and featured snippets you want to outrank and optimize your content to do just that. Both short-form and long-form content can rank in position zero, but most featured snippets link to high-quality content that offers ample details. Depending on the topic, you could provide step-by-step instructions, feature several how-to-videos, or make sure you’re thoroughly answering a question. Content that’s easy to understand tends to have a better chance of ranking in position zero. While you don’t have to water down expert-level content, you can make it easier to parse by adding appropriate subheadings throughout and inserting lists and tables where helpful. Your content in its entirety doesn’t need to fit within a certain word count. However, the section that you’ve targeted for the featured snippet should be short and sweet, as Google typically highlights featured snippets between 40 and 50 words. To increase the chances of your content ranking in position zero, try making lists and paragraphs relatively short and distinct. Most featured snippets include graphics, and the more eye-catching your images are, the more likely readers are to click through to access the entire article. Since you can’t control which image appears in the featured snippet, commit to using only high-quality images that are sure to grab readers’ attention. Ensuring that your content lands in the featured snippet spot takes work, but there’s a good chance that it will pay off. Keep these tips in mind, and you can create high-quality content that answers important questions, delivers added value, drives conversions, and ranks in position zero.